Pro-Finish® cabinets are the preferred choice in production applications. These rugged, easy-to-use cabinets are available in five standard sizes with your choice of a dust bag or dust collector and can be ordered as either suction systems or high-velocity pressure blast systems, which boost production rates in many jobs by 400 percent or more. Because Pro-Finish® systems feature a modular design approach, you can select from a wide range of standard factory options to meet your particular application requirements precisely. In other words, you can tailor a Pro-Finish® system to your requirements without paying for features and accessories you don't need. 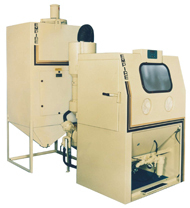 Within the Pro-Finish® line, we offer heavy-duty basket blasters for automated batch processing of work pieces in addition to FaStrip™ cabinets designed for maximum productivity with plastic media. Even if your application is specialized, you can often enjoy the benefits of a Pro-Finish® system. Because Empire draws on a wide range of standard options to modify cabinets to your specific needs, you get proven Pro-Finish performance and dependability with a minimum of costly custom engineering. These blast cabinets provide an excellent value when your blast needs are occasional. They retain many of the operational features of our heavy-duty cabinets, but at a lower cost. The most basic models include a dust collection system, a replaceable viewing window, and a movable foot-treadle control. Econo-Finish® Reclaim cabinets can be specified with complete media reclamation systems that reduce costs by recycling good abrasives while removing fines, dust and debris.